How many words are left that haven’t been used to describe Julie Newmar? I know I’ve used many myself: “Beautiful,” “seductive” and “alluring” come immediately to mind. 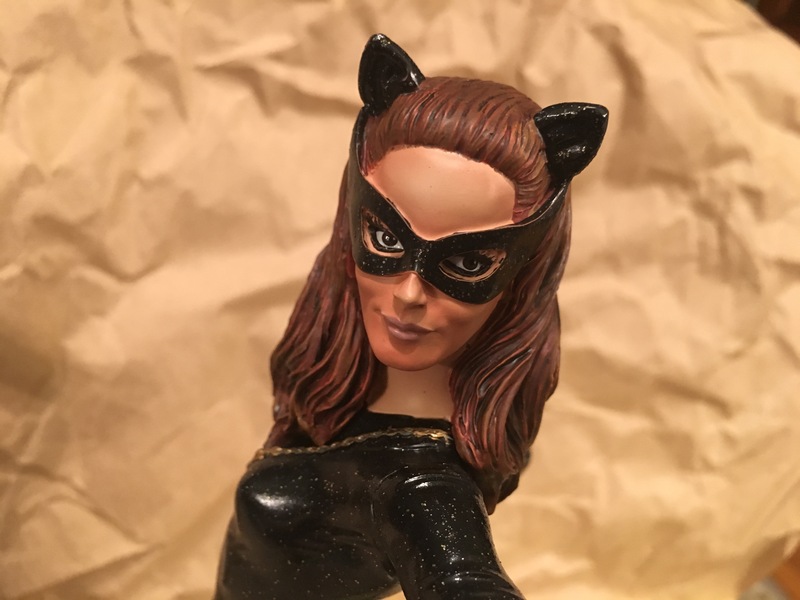 But the one that always jumps to the top is “statuesque,” so it’s no wonder that no less than four companies have produced or are producing statues of Newmar’s Catwoman in a variety of styles. This Catwoman has a lot to recommend it. For starters, there’s Clayburn Moore’s sculpt. 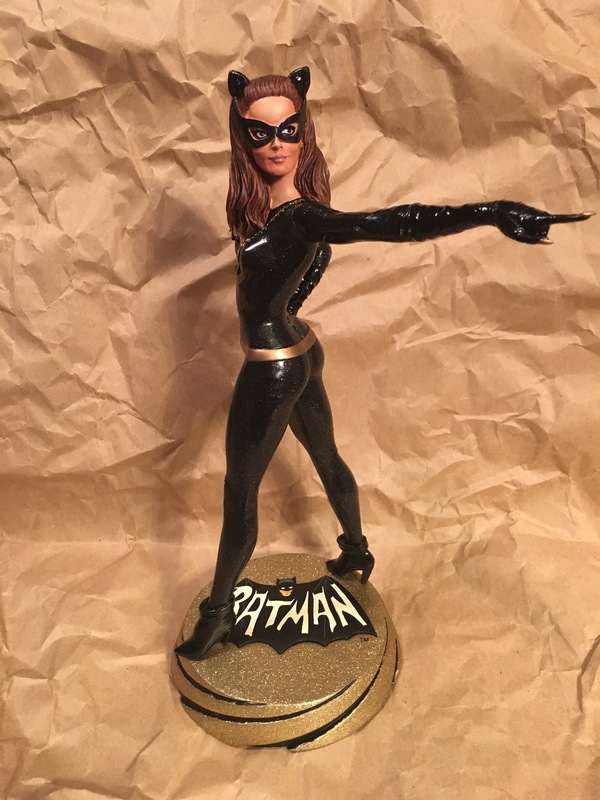 It’s an unorthodox pose, with Newmar’s feline fatale pointing back toward an unseen adversary — presumably Adam West’s Batman — steady and playful at the same time. Her necklace, which was missing in early prototype shots that sent fans into a mild and unnecessary panic, came out very nicely. As they did with Batgirl, Diamond got the spangly accents of her bodysuit just right. And they improved on the generic platform with a black-and-gold color scheme. Batgirl’s green stand is a little ho-hum, though I suppose it does echo the green background of the show’s opening credits. The interesting thing about Diamond’s statues and busts is that while they capture the actors’ likenesses very well, they sometimes appear to be more stylized than photorealistic. Adam West’s jaw is slightly more square and his midsection is slightly more trim on his mini-bust than in reality, for example. 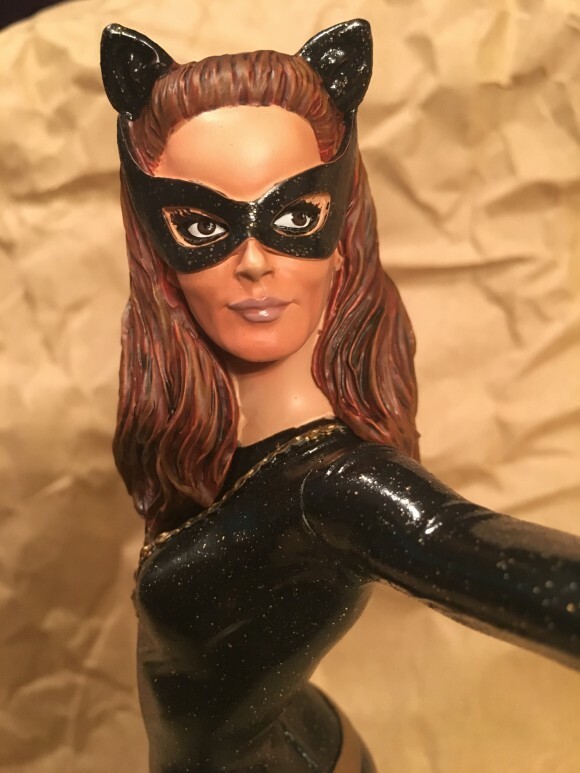 In this case, Catwoman looks a bit more like, say, a beautiful Mike Allred drawing than a photo. But I’m totally cool with that — and, man, those cheekbones! 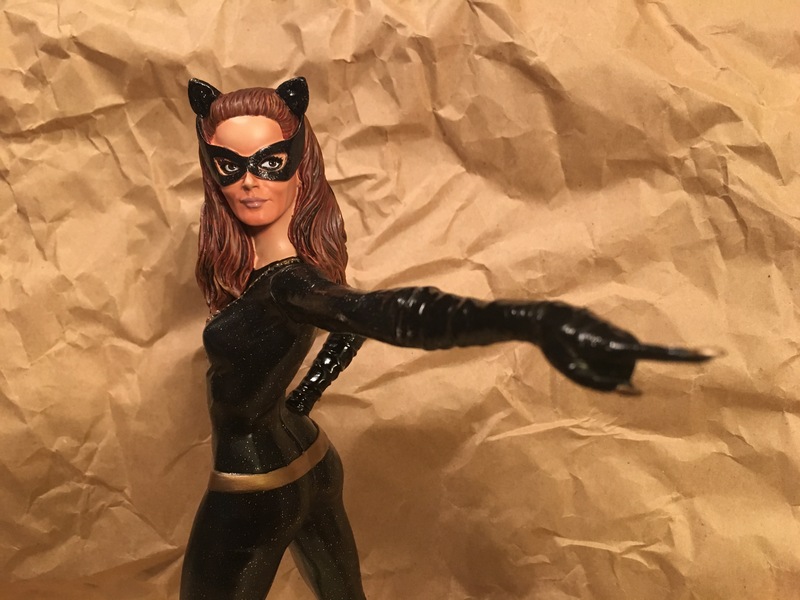 Diamond’s Catwoman is also more affordable than some other options, at $150. That price tag is nothing to meow at, if course, but if the next price up is at least $250, you’re well ahead in the merchandise cat-and-mouse game. 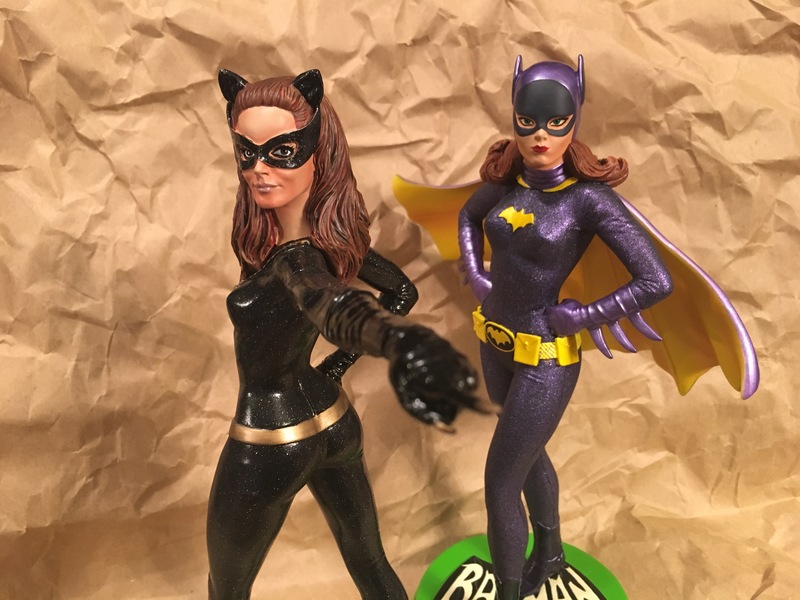 REVIEW: The Yvonne Craig Batgirl statue. Click here. 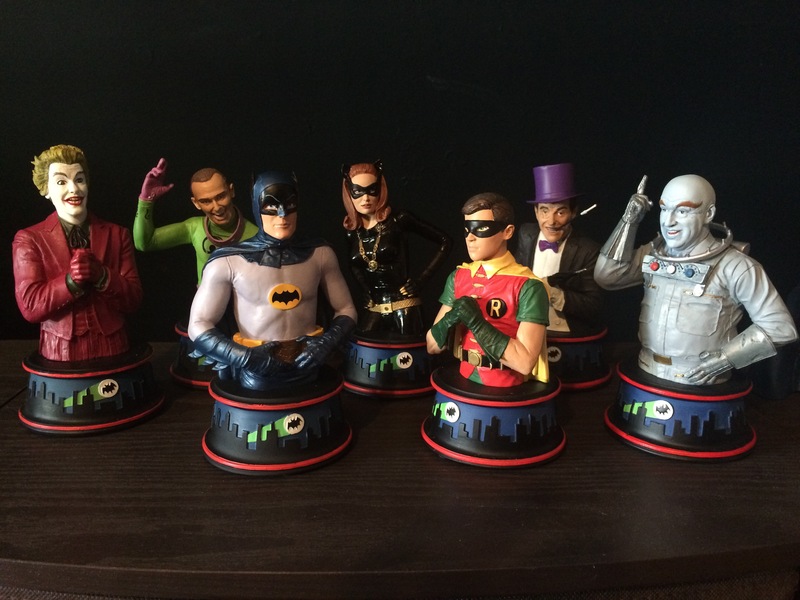 REVIEW: The Batusi Batman and Egghead busts. Click here. 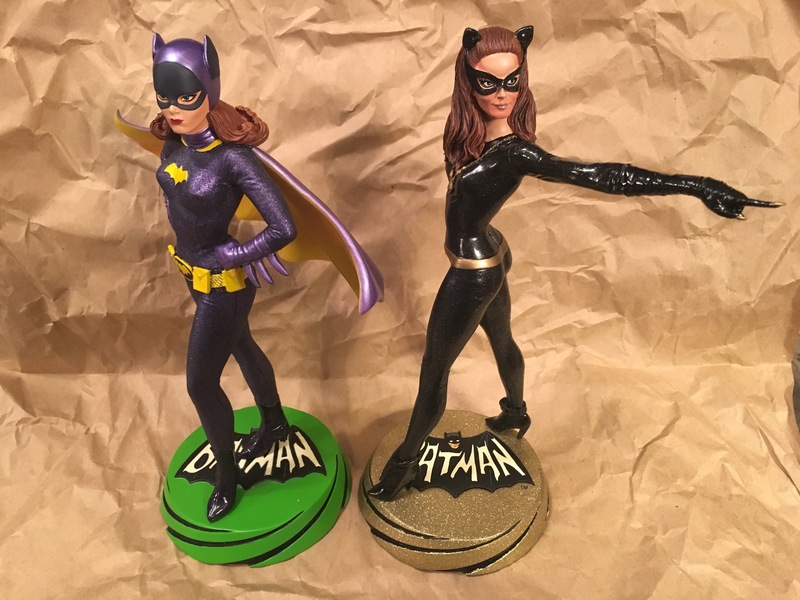 BUILDING BATMAN ’66: From Sketch to Sculpt. Click here.